In New York City, it’s easy to take water for granted. We open the tap and it appears. We might take a twenty-minute shower without hesitation. Water makes up more than 60% of our bodies, and while everyone needs it to live, increasingly we’ve come to think of it as a commodity to be bought and sold thoughtlessly. Meanwhile, there is unequal access to clean water in many regions across the country and throughout the world, where scarcity renders visible the substance’s basic vitality to all living things. From the water wars that have taken place over the last twenty years in Latin America, to the recent privatization of public water in American cities like Flint and Detroit in Michigan, the consequences of fragmented or shortsighted perspectives on the way this resource should be used and managed are stark. And yet, the interests of corporations and private entities continue to be a powerful force shaping the distribution and quality of water. 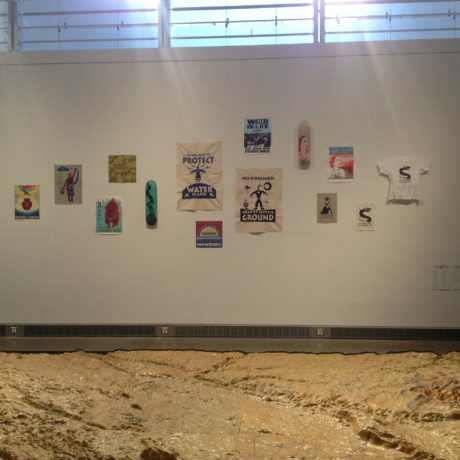 Highlighting the urgency of this issue, Commonwealth: Water For All brings together We Are the Storm and Wellspring, two recently acquired portfolios of artists’ prints developed by the Justseeds Artist Cooperative on the subjects of climate change resistance and water. This exhibition also features a selection of materials on loan from Interference Archive which feature the now iconic graphics developed for the 2016 movement against the Dakota Access Pipeline at the Standing Rock Reservation in North Dakota. Commonwealth is the third in a series of exhibitions that features contemporary expressions about water, its utility, and its preservation and consumption in dialog with the Museum’s long-term display of the Relief Map of New York City’s Water System, a sprawling WPA project commissioned for the 1939-40 World’s Fair. The model traces the flow of water from the mountains of upstate New York, through a series of aqueducts, to New York City. This exhibition is organized with Josh MacPhee, co-founder of both Interference Archive and the Justseeds Artist Cooperative. Interference Archive is a library and social space run entirely by volunteers in Gowanus, Brooklyn. Its mission is to explore the relationship between cultural production and social movements. This work manifests in an open-stacks archival collection, publications, a study center, and public programs including exhibitions, workshops, educational visits, talks, and screenings, all of which encourage critical and creative engagement with the rich history of how people have organized to transform and improve their lives. Justseeds Artist’s Cooperative is a decentralized network of artists committed to social, environmental, and political engagement. Each year Justseeds’ artists assemble a print portfolio responding to a key social issue that included mass incarceration, resource extraction, anti-war veteran’s resistance, immigration, and gender justice. The environment, and climate justice in particular, have been core concerns of the group. In 2015, the Cooperative collaborated with Culturestrike, a network of socially engaged artists that seeks to cultivate and support political art through a variety of programmatic and educational initiatives, to create the print portfolio We Are the Storm, which paired artists with grassroots organizations and communities building resilience in the face of climate chaos. In 2016, Justseeds released Wellspring, a smaller portfolio initiative dedicated entirely to the issue of water. In conjunction with Commonwealth, Queens Museum has made a donation to the Water Protector Legal Collective, an organization working in partnership with the National Lawyers Guild to protect the sovereign treaty rights of the Standing Rock Sioux Tribe, and provide legal representation and coordination for those who engaged in resistance to the Dakota Access Pipeline.